Most of us think of exercise in terms of how we want to look—losing weight, a carved six pack, the firm fanny, or chiseled arms. Sure, those are great, but exercise has wide-ranging benefits that go far beyond just looking good. Aside from the health and physical benefits, did you know that exercise–especially weight training and High Intensity Interval Training–can actually slow down the aging process? 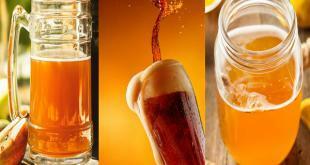 Yes, it has been scientifically proven to slow aging dramatically! Researchers have discovered a way to actually shave as much as ten years from your age with vigorous exercise. And no, you do not need to start training for an Ironman, you just have to start getting exercise in your life. Exercise has the ability to not only change the VERY cells in your physical body to slow down aging, and actually change the structure of your brain as well, making you feel stronger, more confident, happier and more focused. Starting an exercise program today, no matter how old you are, will absolutely change your life for the better! After the age of 35, most adults begin to lose 8-10% of their muscle mass per decade. That means by age 55, you have lost up to 20% or so of your muscle mass—if you aren’t exercising. This sneaky condition means your metabolism—and your ability to burn fat—decreases drastically with loss of muscle, and that worst part is that you probably don’t really notice the muscle loss, until you get to a point where everyday activities become difficult. Muscle is one of the most metabolically active parts of our bodies, so losing muscle means our metabolism drops! Research from UCLA suggests that the more muscle mass older people have, the longer they can expect to live. These findings add to the growing evidence that overall body composition—how much muscle you have, versus how much body fat you have—not the more commonly used and less specific measurement of body mass index (BMI), is one of the best predictors of all-cause mortality. Aging can make our joints and bones more subject to arthritis (inflammation) and osteoporosis (weak bones). Obviously, these two things can lead to injuries and immobility as we age. Lifting weights and most kinds of weight-bearing exercise actually help to manage arthritis pain and create more mobility in our joints. Strengthening the muscles around joints not only helps to support, lubricate, and strengthen your joints, but the tug on your muscles and bones created by resistance exercise (like weight training) actually will help to strengthen bones and counter osteoporosis. Even people with mild to moderate hip arthritis can avoid the surgeon’s knife and hip replacement surgery by exercising. And exercise helps to improve flexibility, movement and joint range of motion as well. Have you put on a few pounds as you have gotten older? Muscles and the mitochondria in our cells are strong determinants of our metabolism. Metabolism, as you may know, has to do with how many calories you burn in a day and how much energy you have. As mentioned above, losing muscle mass also creates a drop in your metabolism. Think of muscle mass as our ‘engines’. If you want to boost that metabolism back up, start a weight training program, which revs up our physical engines. Adding muscle to your body, is like adding high octane gas to our body’s engines! More muscle, more ‘horsepower’, more metabolism—and more energy! Men who are looking to replace their declining levels of testosterone and DHEA will be happy to know—just 12 weeks of strength training significantly increases levels of free testosterone and DHEA. Testosterone and DHEA (a pre-cursor to testosterone) not only helps men in the bedroom, but it also benefits the body’s ability to burn fat, but it helps prevent heart attacks, and helps with feelings of empowerment, confidence and mental clarity as well. And ladies, this is for us too! Women actually need testosterone and DHEA for libido, mental clarity, confidence and ability to burn fat too! We don’t need to set a goal of looking like fitness models to feel like our workouts are paying off—simply working out consistently will improve your health, your fitness AND your appearance. Strength training, aerobic training or HIIT will not only help you start to burn off some of that body fat, but your muscles will become a bit more defined, you will stand a little taller and walk with a bit more confidence too. Exercise will help your body to burn off that dreaded belly fat as well. Exercise scientists at the Harvard T.H. Chan School of Public Health found that healthy men who did 20 minutes of daily weight training had less of an age-related increase in abdominal fat compared with men who spent the same amount of time doing aerobic activities. Exercise also improves your skin tone and helps you avoid the droopy skin look. We women especially hate that droopy skin/fat on the backs of our upper arms, but if you build up and strengthen those arm muscles, you can firm up this area, and have nicely defined arms. And it works for all those other areas of your body prone to drooping too! Because exercise speeds up your circulation and flushes out toxins, your skin begins to glow as well. A study of almost 6,000 adults in the U.S., showed that those who exercise regularly are younger on a cellular level than those who lead sedentary lifestyles. 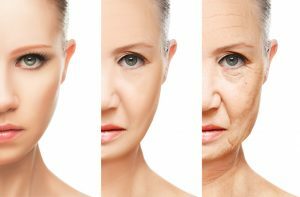 Researchers can look at the telomeres on your chromosomes to determine how fast or slow your cells are aging. Telomeres are the protective caps on the ends of your chromosomes in each of your cells. Telomeres are a little like those plastic ends on shoelaces that keep them from unraveling. Every time our cells divide, the telomeres shorten. When the telomeres become too small, the cells die, which is a big part of how we age. Short telomeres are related to many age-related diseases, including cancer, stroke, Alzheimer’s, and cardiovascular disease. 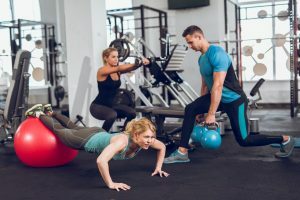 In the study, an exercise science professor from Brigham Young University compared the telomere lengths in those who did regular vigorous exercise and those who were sedentary. His conclusion was startling: the more physically active we are, the less our biological aging. In other words, exercise truly does slow down our biological aging clock. In fact, vigorous physical activity can take about ten years off your age, and moderate physical activity can turn back the clock about seven years. Who doesn’t want to be 7-10 years younger?? The best thing is, you don’t have to be an Olympic athlete to reverse the clock; it only takes a minimum of 30-40 minutes of running or other moderate to vigorous exercise five days a week. One of the biggest and best new forms of exercise to hit the mainstream is HIIT, or High Intensity Interval Training. This is a fast-paced, intense form of exercise that creates the biggest effect in the shortest amount of time. HIIT has been known to burn the most calories and increase overall fitness in the shortest period of time. HIIT exercise works like this—it alternates short intervals of maximum effort combined with several short recovery times. Often those intervals are 3-5 minutes or less of hard exercise with a couple minutes of rest. There are many different varieities of HIIT workouts, but they all have the same benefits. HIIT can boost your metabolism for hours, melt off fat, build muscle, and maximize those awesome exercise endorphins that give you that wonderful exercise ‘high’. Now, the Mayo Clinic also says HIIT can stop the aging clock as well. The study, published in the journal Cell Metabolism, involved 72 sedentary adults in two age groups—young (18 to 30) and older (65 to 80). The participants were assigned to one of three 12-week workout routines: high-intensity interval cycling, strength training with weights, or a combined strength-training and cycling plan for three months. The HIIT training plan required three days of cycling with four, 4-minute high-intensity intervals and 3-minute recovery periods), and two days of steady, brisk treadmill walking. 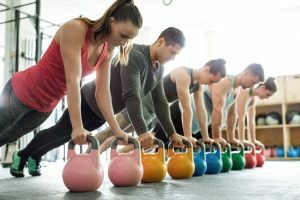 The strength-training group performed upper- and lower-body exercises twice a week, while the combined-training group worked out five days a week at a steady state, and for less time. At the end of the study period, all three groups had gained lean muscle mass and improved their aerobic capacity. But the HIIT group had noticeable changes at the cellular level. Younger volunteers experienced a 49% boost in mitochondrial capacity—the cell’s ability to take in oxygen and produce energy—while the older age group had a dramatic 69% increase! Mitochondria are our cells’ powerhouses and are important to vitality, oxygen-burning capability metabolism, and energy. In essence, the health of our cells, and our bodies (which are made up of cells) is directly tied to the function of our mitochondria. The bottom line is that adding short bursts of high intensity exercise is a great way to boost the benefits of exercise even more. Even finding a path where you can run for short bursts or pedaling your bike up hilly sections in a road will work. Obviously, you want to gradually ease into this type of exercise. There are many different types of HIIT workouts online as well. What if you could do something that would immediately improve your mood, your focus and your memory while protecting your brain from Alzheimer’s, dementia, ADD/ADHD, and banish depression and anxiety? That’s exercise! According to neuroscientist, Wendy Suzuki, exercise actually helps your prefrontal cortex which is involved in focus, attention, personality and judgement, to improve and grow, improving your capacity for focus and improving your mood. And what’s more, exercise helps to increase your long- and short-term memory. A single 30-minute workout increases your ‘happy’ brain chemicals of dopamine, serotonin, and noradrenaline, improves your focus and attention as well as your reaction times. Exercise actually helps your brain make new brain cells and helps your brain to expand and become stronger. And these benefits stick with you! Your body changes for the better, your health improves, your metabolism improves, your moods improve, you gain confidence, you move better, you feel stronger, you stand up straighter, and your whole life improves with regular exercise. So, start now–whether it’s simply walking, running, cycling, strength training, or High Intensity Interval Training—or any combination of the above exercises. You will feel better–mentally, physically and emotionally–and your body and brain physically change for the better as well. Don’t wait, start now. It’s never too late! 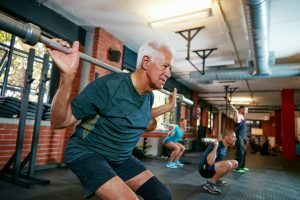 If you find this article interesting, our friend Steve Holman shows you what exercises can SLOW the aging process, and which ones actually can accelerate it. A regular and tested exercise schedule should definitely improve health of both young and old.Important thing is time management to reserve a period in the day to avoid breaks in the schedule.I have my own experience in the effect of regular exercise vs no exercise.So its a must for everybody who desires long life.